Kayaks saw a rise in popularity in the recent years since the majority of people developed an interest in them. As a result, multiple companies started coming up with their products on the market. We came to a conclusion that most people describe modular kayaks as a win-win solution. Having read a couple of modular kayak reviews, we’ve selected one and reviewed it ourselves. There are other numerous categories out there in the market which includes sit-in, sit-on-top, hard-shell, inflatable kayaks and many more. However, let us tell you why the modular kayak type is so special. The modular kayak which we will be reviewing today is the ‘’Point 65 N Tequila GTX Solo’’. Here is a quick recap on what we think of this kayak. Can be easily transformed to single or tandem. The seating backrest quite slippery. The designer behind this kayak is Magnus de Brito. His primary intent was to make this kayak as modular as possible. The reason why this design is so innovative is that there aren’t many modular kayaks on the market. It has manageable sections that lock securely together and make it an easy fit for most SUVs and larger cars. These sections are quite easy to assemble. The only thing that you need to do is line them together and tighten them up. There are two ratchet strap locking connectors on each side of the kayak. When tightened properly, they prevent the parts from separating. We applied some force and tested how well these straps perform. It’s safe to say that, once the parts are connected, nothing can separate them. Disassembling is just as easy. When you’re done paddling, just release the straps and separate the pieces. 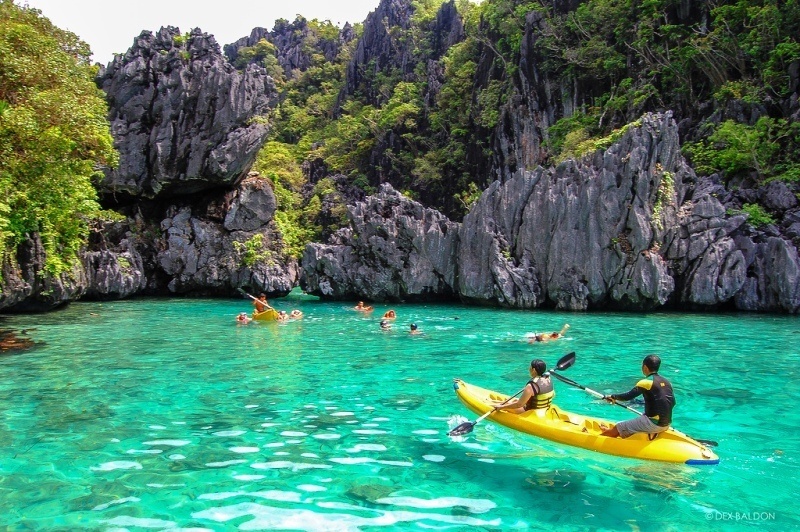 Kayaks are usually small and narrow boats which are often used for sports or fishing. However, sometimes they can be hard to store, transport, and handle. Kayaks are usually long (around 8 - 10 feet). Their length depends on what type of a kayak it is (solo or a tandem). The design of this kayak is probably what is its main selling point. There are a lot of people who find it challenging to transport their kayaks. That is why having a sectional kayak can be quite handy in said situations where storage space is low. This is a solo modular kayak, which means that you only get two pieces. It can also be easily converted into a tandem one by purchasing an additional middle piece. There’s also a possibility of transforming it into a multi-personed boat. 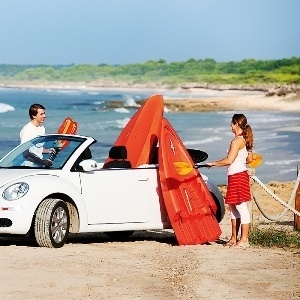 You don’t have to worry about getting a tandem kayak and not having the place to store it. With a modular one, you can even separate the parts and store them in different places. In addition to being extremely portable and modular, it also offers a decent level of stability. Now, keep in mind that this is a Sit-On-Top type of a kayak. What this essentially means is that you will be propelled above the hull and you’ll sit on top of the cockpit. Higher seating usually lowers the percentage of protection and overall stability. However, we’ve noticed that N Tequila is just as stable as its traditional counterparts. N Tequila features an AIR seat with a pneumatically adjustable backrest. While this increases comfort, we’ve noticed that it tends to slide back and forth. The seat itself is comfortable, but the fact that it moves a lot cripples the aspect of comfortability. You can control and maneuver the kayak easily. There’s even a tracking keel that allows you to paddle straight as an arrow. The kayak seems to be very agile and steers with little to no effort on your part. 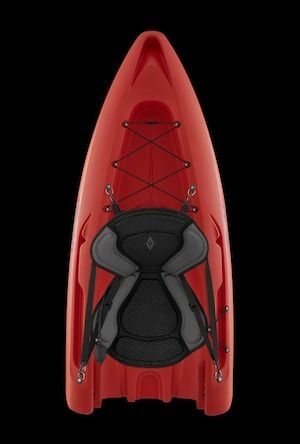 The kayak also features contoured 4-position foot braces, 2 rod holders, and a molded-in cup holder. One drawback regarding this kayak is that it does not come with paddles. Point 65 sells them separately. You can purchase paddles along with the kayak, and they’ll ship it together. However, there are numerous companies that include paddles and additional equipment into the price. If you already have paddles, then this is nothing to be concerned with. On the other hand, if you’re purchasing your very first kayak, perhaps you can opt for a different one (if that’s your main concern). Before we move on to its summarized positives and negatives, here’s a short paragraph about the hull’s specifics. The total length of this kayak is about 295 - 300 cm (the front section is 166 cm, and the back section is 169 cm). We’ve mentioned before that it can be converted to a tandem or a multi-persons kayak. That means that the length will differ with each added piece. Its width is about 67 cm, and it weighs around 60 pounds (when assembled). When disassembled, each piece weighs around 25 - 30 pounds. Probably one of its key features is the ability to separate it and modify the whole kayak to your liking. You can easily transform it into a tandem or a multi-persons boat if you ever decide to. You would have to buy additional pieces of course, but you get the advantage of using one kayak instead of having to switch between multiple ones. It is a revolutionary solution for anyone who wants to switch between using their kayak solo or along with a family. Due to the way it’s designed, it allows for easy transportation and storage. With this kayak, you don’t need additional help in order to drag it to the water. You can assemble it right next to it in a matter of seconds. You can store the parts in any RV, SUV, or a larger car. It’s suitable for apartment dwellers as well because it can fit even in a closet. We think that this is probably its main selling point since most people find it hard to transport and store their kayaks. 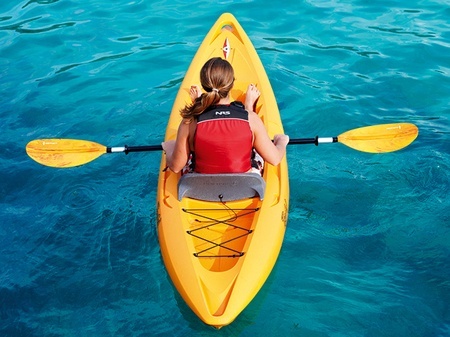 Despite its sectional design, this kayak offers enough stability and safety just like any other traditional kayak. When we first saw it, we thought that the whole kayak would wobble. To our own surprise, we have been proven wrong. Once you connect and tighten the straps, there’s literally no way that the pieces will separate. ​There are some of you who won’t see this as a drawback as most kayaks are sold without paddles. However, people who are just getting into the hobby will want to have all the necessary equipment right away. N Tequila does not come with paddles, so you will have to purchase them separately. ​Many users have complained that the AIR seating backrest tends to slide around. Unfortunately, we have to agree with their complaints. The seating itself is very comfortable. It works perfectly fine when your kayak is stationary. However, once you start paddling, it starts to move as well. The main intent behind this kayak is for it to be used in casual flat water paddling. That means that it does not fare well against the oncoming waves since it’s so lightweight. Longer trips usually increase the chances that the weather conditions will change. Technically, it can be used, but we strongly advise against it. Check out this article for more kayaks suitable for casual paddling. N Tequila is perfect for short recreational day trips and activities (such as fishing). If you want to go on longer trips and expeditions (such as touring and surfing), it’s better that you opt for a different kayak. The seating backrest is quite slippery. Point 65’s N Tequila offers enough quality that manages to stay on par even with some of the more expensive kayaks on the market. It’s an excellent Sit-On-Top model that is primarily oriented towards recreational use. Due to its innovative design, you can store it almost anywhere and handle it with ease. 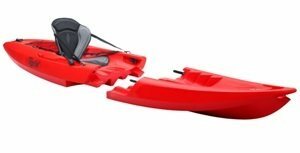 We don’t think that there are many companies that manage to pull off sectional kayak design properly. This kayak proved us wrong. However, it is definitely not without flaws. There are a couple of minor issues regarding the seating and the lack of extra equipment. If you’re able to look past that, you’ll end up with a decent kayak for a decent price. Regardless of whether you’re using it solo or tandem, this kayak will not disappoint you. You can rest assured that you’ve made a wise and proper investment. This kayak made it into the list of our modular kayak reviews because it underlines and affirms everything that we stated.